Tangled and True: pink isn't just for girls anymore. unfortunately for my husband, he chose a profession that requires him to "dress up" most days. luckily, he doesn't mind shopping & is always on the look-out for something a bit different. 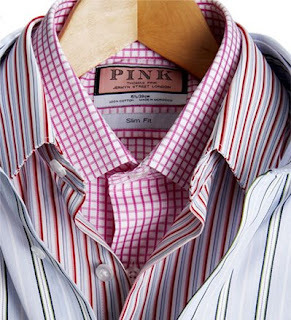 his latest favorite find is thomas pink, an english shirt & tie company. their men's shirts offer formal, slim fit & casual styles, so there is definitely one for every occasion. & just so you don't feel left out, they make women's shirts as well. my hubby loves the quality & variety that pink shirts offer... they come in twills, royal oxford, poplin & luxurious cottons, in just about every color, including stripes, checks & prints. if that's not enough, you can also custom order ties. anyway, be sure to check out thomas pink. i guarantee your husband will like the way he looks, better yet, you will too. if you hurry, you won't miss out on their fabulous summer sale! p.s. ever wanted to know how to tie a tie? instructions for everything from the basics to a full windsor can be found HERE.